During the summer of 1776, while other men were meeting in Philadelphia, a group of men were holding frequent meetings to attempt to organize a church for the isolated but growing community of "Pond Town". Their efforts were finally brought to fruition on September 4, exactly three months after the affixing of the Signatures to the Declaration of Independence. The first services were held at the local tavern, Squier Bishop's Inn. For the next 49 years, with frequent gaps when there was no ministerial leadership, the small congregation continued to worship in that building. In June of 1825, the Masonic Lodge of Winthrop (Temple) laid the cornerstones of two churches. On June 7th the brethren marched from their hall to the site of the new Congregational Church located on what is now upper Main Street. On the 25th they repeated the Ceremony at the Methodist Church. 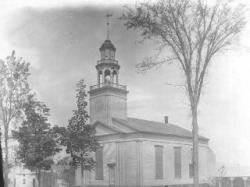 From that year until 1904, this building was the home of the Congregational Church. During the first few months of the Civil War a new minister was called to serve the church. Shortly after his arrival, he gave an address outlining what he saw as the needs of the church and community. It was his vision that a "Chapel or Vestry" be built in the center of town. This was done in 1861 and is the present building of this Congregation. At the turn of the Century there was considerable concern about the two buildings. Plans were laid for the complete renovation of the "Vestry" including the construction of a steeple, raising the building and installing a meeting room and kitchen beneath, and making an addition to the rear of the building. With only minor changes, the building remains in this condition today. This work was completed and a service of rededication held in 1904, at which time the large building on Main Street was sold. All three buildings which have housed this congregation are still standing and in use today. For the first 30 years of the life of this church, there were frequent changes in Pastoral leadership in spite of the difficulty of procuring the services of clergy in this remote section of then Massachusetts. In 1807 a call was extended to Rev. David Thurston. In accepting this call, he began one of the longest and most fruitful ministries of the nineteenth century in this area. During the first year of his ministry he organized a Church School, the first in Maine and possibly tile first in New England. He served for many years as the head of an organization which fostered this movement across the state. He was also a widely known preacher much in demand for addresses on special occasions. His fame was matched by his strong views and strong personality. It was these characteristics which led to his resigning the pulpit of this church in 1851. In those antebellum years churches all over the country were debating the issue of slavery, an obviously moral question. Mr. Thurston was unalterable in his opposition to the "peculiar institution" and was vehement in his demands upon the church to follow his views. This irreconcilable position caused the church to ask for and receive his resignation. In recognition of the long years of faithful service and great achievements, the large marble tablet was erected in the church sanctuary. In 1967 the church voted to become a part of The United Church of Christ. This was an emotional step as it created fear among many that the church would no longer be independent. Time has laid to rest this issue and removed the fears. The church has also been the recipient of a large legacy from Alice Keening. This has enabled us to consider a major renovation project which is now being brought to reality and hopefully will he completed by the time of our Bicentennial in 1976. Please click on links below (or use navigation tabs) to view additional historical pages.